Imagine having the ability to keep track of your every movement right on your wrist? That idea alone is what made fitness trackers boom in popularity over the years, but it’s important that you find a device that tracks everything you’d be interested in. With the ability to burn more calories and build more muscle by staying up to date with your every movement, the Letsfit Fitness Tracker has plenty of phenomenal features to offer. 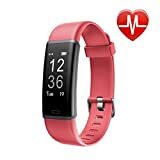 The main purpose of the Letsfit Fitness Tracker is to give wearers the ability to finally know a wide variety of statistics about their everyday life in an effort to help improve their overall health. It’s simple to assume that you walked for about 30 minutes on Tuesday, but what if in fact, you walked for 45 minutes without knowing? There are plenty of interesting statistics that the Letsfit Fitness Tracker keeps track of, and you can easily review them with the help of an app or directly on the tracker itself, which makes being more active easier than ever before. There is an assortment of features that you’ll be able to use to your advantage, especially when compared to other fitness trackers that are four times more expensive and do far less. Who Is This Fitness Tracker Meant For? In all honesty, there isn’t a specific type of person that will benefit more from using the Letsfit Fitness Tracker, as it’s a highly adaptable piece of technology that can be worn by absolutely anyone in the family. Above all else, you don’t have to be a gym or fitness enthusiast in order to benefit from wearing it as there are plenty of parameters that it keeps track of throughout the day. No matter if you’re simply interested in knowing what your heart rate is throughout the day or if you want to know how far you’ve traveled on a hike, the options are relatively endless. It’s nice to know that the Letsfit Fitness Tracker is so adaptable that both active and sedentary personalities will be able to benefit from it. When you purchase the Letsfit Fitness Tracker, you’ll receive everything in the box that you will need to use, so you no longer have to buy any accessories of parts. You may also notice that the device may arrive with a full charge as soon as you unbox it, which means that you can literally wear it as soon as you receive it. In your box, you’ll receive the fitness tracker, a USB charger, and an instruction manual. Inside of the instruction manual, you’ll read about how to install the VeryFitPro app where all your data will be stored for your review. Never Miss Calls and Messages: See call, SMS and SNS notifications on your wrist to keep your phone out of sight and your goals in focusCustomer Service: 7*24H email reply, 60 days replacement or refund, 12 months warranty. Heart rate monitoring: By far, the most popular feature of the Letsfit Fitness Tracker is its heart rate monitor. Your new device will monitor your heart rate 24 hours a day, seven days a week, and give you updated information about how your rate changes throughout the day. You’ll finally have access to all the data you need in order to improve your heart health and get more active. Sedentary alerts: Instead of spending the majority of your day relaxing and avoiding the gym, the sedentary alerts are programmed directly into your fitness tracker and let you know when you’ve been sedentary for too long, encouraging you to get up and be active. Waterproof: Although it’s not recommended to wear your fitness tracker when you’re swimming or showering, it has been designed to be life-waterproof. Meaning, you can splash water on it without having to worry about any damage to its delicate components, which makes it safe to wear in the rain or while you’re washing your hands. Sleep monitoring: Another popular feature of the Letsfit Fitness Tracker is its sleep monitoring software that will record the different stages of sleep that you enter based on your heart rate. It will also keep track of how many times you are disturbed during the night and how often you wake up to give the information you need to know whether you’re getting a restful night’s sleep or not. Multiple sport tracking options: No matter whether you’re running, cycling, or doing yoga, your new fitness tracker will be able to give you highly detailed information about your workout. You even have the ability to sync the device with the GPS on your smartphone to review maps of your workout. Smart notifications: Aside from the ability to set alarms through the VeryFitPro app that remind you of important events throughout the day, you’ll also be able to receive notifications about texts, incoming calls, and social media alerts without having to open your phone. The vast majority of competing fitness trackers offer the same tracking capabilities, but the LETSCOM Fitness Tracker has one main difference that you might be more interested in, and that is waterproofing. Compared to the Letsfit Fitness Tracker, which is classified as “life-waterproof”, the LETSCOM Fitness Tracker is entirely waterproof, making it safe to wear while you’re swimming or showering. It is available for the same price as the Letsfit, so if you want to never have to worry about taking your fitness tracker off because of water, the LETSCOM model may be a better option for you. Considering the Letsfit Fitness Tracker is available for one fourth the price of high-end fitness trackers yet does all of the same things makes it one of the best devices you can get your hands on. It may not have a name brand, but it has a slew of features that work very well, and it’s also constructed with the everyday wearer in mind. No matter if you’re looking for an activity tracker for yourself or your children, the Letsfit Fitness Tracker has plenty of benefits to offer and it is incredibly easy for everyone to use.